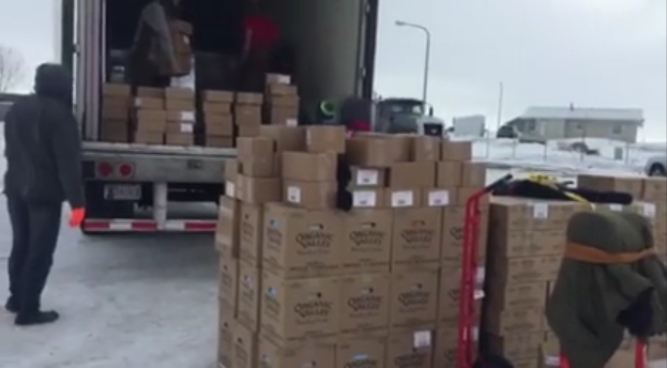 Winter Solstice at Standing Rock was warmed by the generous donation of hundreds of pounds of organic food for all the Water Protectors, delivered from Organic Valley, in La Farge, Wisconsin. What began as a spirit camp of prayer in April 2016 with some 50 people, who opposed the Dakota Access pipeline coming onto ancestral Sioux territory, has turned into the largest gathering of American Indians in over a century. It is difficult to have an official count, but literally thousands of American Indians have come to Standing Rock during the past several months in the effort to show solidarity for the water protectors. The water protectors’ rallying cry has been ‘mni wiconi,’ which means water is life. During the intervening months, the water protectors have faced vicious German shepherds and pit bull dogs, high-pressure hoses from water cannons, grenades, rubber bullets and arrests. Even with the adverse circumstances, the fight to protect water and tribal sovereignty has kept those at Standing Rock strong. After all, American Indians are warriors. Tribal leaders and spiritual leaders have consistently reminded the participants at Standing Rock that the fight to oppose the pipeline has to be won through prayer and peace. On this Christmas, some 1,000 water protectors are on site at the encampments to pray and are striving for a peaceful end to the standoff at Standing Rock. Their existence is not necessarily comfortable. They are facing the harshness of a northern Plains winter that brings sub-zero temperatures and fierce winds. The water protectors’ Christmas is not going to be a cozy and comfortable as most of ours across Indian Country. Their Christmas meal may not be nearly as substantial as many of ours. Responses to " Organic Christmas Food Arrives for Standing Rock Water Protectors"
HANG IN THERE AND DO NOT GIVE UP. There are a lot of people all around the earth with you on this. You are right protecting the water and the earth. If left up to the people at the top and the Government, they would destroy all life and the earth. I say this to all, WAKE UP AND STAND UP. Now is the time.